With Paraguay having reached the 2010 World Cup Quarter Finals and with many players in the major European leagues, football is an understandable passion in this country. Olimpia and Cerro Porteño are the two biggest teams in Asunción. A live game is a spectacular experience, although a little hairy – try and go with a local. Meeting on what is called the Triple Frontera, the point where Argentina and Brazil meet Paraguay are the Iguazu Falls, one of the most spectacular sights on earth. The hectic and often overwhelming border town of Ciudad del Este is the perfect crossing point to the falls; you can cross the "Friendship Bridge" into Brazil or head south to Presidente Franco and take a ferry to Argentina. Spend a few days travelling the Rio Paraguay, through the Pantanal wetlands, spotting wildlife and learning about the country's extraordinary history. River tours typically depart from Concepción, stopping at towns and national parks along the way. 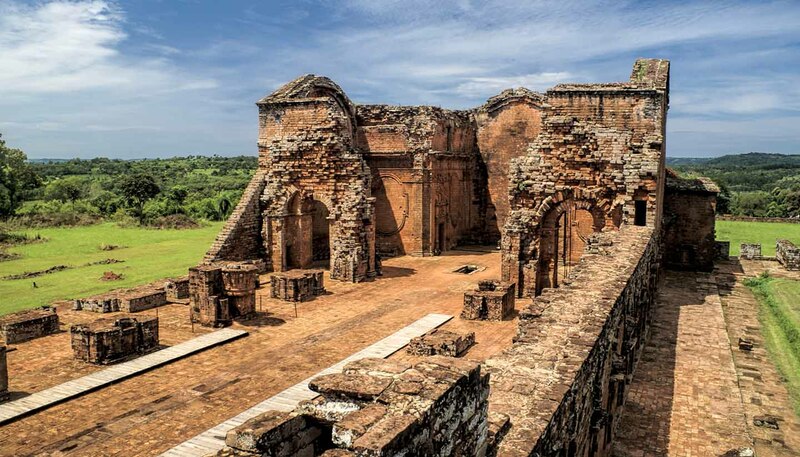 Don't leave Paraguay without visiting the crumbling settlements erected by Jesuits missionaries in the 16th century, who travelled through the region converting the indigenous Guaraní people to Christianity. They built vast complexes and encouraged the locals to abide by fairly rigid socioeconomic structures based on Jesuit values. Only ruins remain and the best preserved sites can be found at Jesús de Tavarangué and Trinidad del Paraná, which have been declared UNESCO World Heritage Sites. The lively waterfront area of Encarnación has earned a reputation as one of Paraguay's major tourist destinations. Locals flock to the beach during the summer season (December to February), which is brought to a close by the biggest carnival in the country. The Paraguay capital is situated on the Bay of Asunción, an inlet off the Paraguay River. Planned on a colonial Spanish grid system, the old town has many parks and plazas. The newly built Costanera runs alongside the river and is a great spot to relax in an afternoon or go for a jog. Close by is the lively and colourful neighbourhood of Loma San Jeronimo, which holds regular events and offers the chance to experience traditional food. Even if there are no events on, it is a worth a trip because it has great views of the city. One of the seven wonders of the modern world, the Itaipú Dam is the largest hydroelectric complex in the world. The water reservoir has attempted to offset its environmental footprint by creating a unique ecosystem for wildlife and birds. Walking tours and fishing expeditions can be arranged at the dam. Prepare to see the breathtaking waterfalls in Presidente Franco just south of Ciudad del Este, 326km (204 miles) east of the capital. The majestic Monday Falls, situated in a 22 acre national reserve, are 40m (131ft) high and are much less crowded than the Iguazú falls across the border. Paraguay's modern history has been defined by the Triple Alliance War that ravaged the country from 1864 until 1870. The war was ended with the death of Paraguay's leader, Mariscal López, who was killed in battle at Cerro Corá. As well as a monument to the fallen leader, Cerro Corá National Park abounds with lookout points and hiking trails. There are dozens of estancias around the country where visitors can get a taste of rural life, ride with the cowboys, take a horse and cart tour or just sit and relax in the country drinking tereré (a herbal infusion). Yerba mate tea is one of the most popular infusions in Paraguay and South America as a whole. In the 19th century it was exported as far afield as England and was exchanged for boats. The major plantations are located in the south of the country and guided tours are available from the city of Bellavista, home to two of the country's major Yerba producers (Selecta and Pajarito). Flora and fauna abounds in Ybycuí, Paraguay's most visited national park. Set in a mountainous area, this forested wildlife haven is crisscrossed by a series of streams and waterfalls. Guided treks depart from the visitor centre, which also provides visitors with information about the park's history – surprisingly, it was once home to a munitions factory. San Bernardino is a peaceful holiday resort situated on Lake Ypacarai, some 47km (29 miles) from the capital. Owing to its beaches and limpid lake, it's very popular with locals during the summer months. It has a camping ground and several good eateries, which celebrate the town's surprising culinary diversity. The Café Frances is a must for merienda (tea). Witness the famous Chaco, a vast, sparsely populated area consisting mainly of empty plains and forests which covers 61% of the country's total surface. It is home to major national parks including the Defensores del Chaco, Tifunque, Enciso and Cerro Cora. It is a bird watchers paradise and if you are lucky Jaguars can also be spotted at night. Paraguay may be landlocked but the Paraná River is so wide at San Cosme y Damián that it gives the impression you have reached the coast. Impressive sand dunes along the banks of the river are a must-see and so are the Jesuit ruins in the town, which makes the perfect stop off for those travelling between Asunción and Encarnación. Located a short drive from Asunción, this wildlife reserve specialises in adventure activities to get the adrenalin pumping. Safely tied to a security rope, visitors clamber through the forests canopy, before zip-lining down to earth. There are also guided walks for those who like to keep their feet on the ground.